I have maxed out my passive INT & STR, so now I am trying to decide which to go for next. I realize that Passive Damage probably will boost my damage more, but Dex also gives health points along with some dodge & crit, so I want to consider the entire picture here. If my damage is around 250, then 1% damage boost would be 2.5. Approximately how much would 5 dex points add to my damage? The Castle That Never Was, with my Shadowstar and Eternal Frost, also with Ebonine. So you've maxed str and int, I maxed int then dmg, then str. I suggest maxing out int, str, and dmg passives. After that, I would recommend dex passive or critical. The Brightest of Flames..cast the Darkest of Shadows..
One who knows nothing cannot understand anything..
You can use pets to see the effect of such things without respeccing. Granite gives 25 dexterity, and that adds 3.5 damage to my stats. So 0.7 damage per 5 dexterity points. Not impressive, if you ask me, so I went with passive int & str like you, and now I'm adding passive damage. Just want to make clear that I simply summoned Granite. JaytB below gives the pure stats without the bonus damage you get from int points. That's why the numbers are different. Last edited by Asireuz; 04-22-2013 at 04:44 PM. 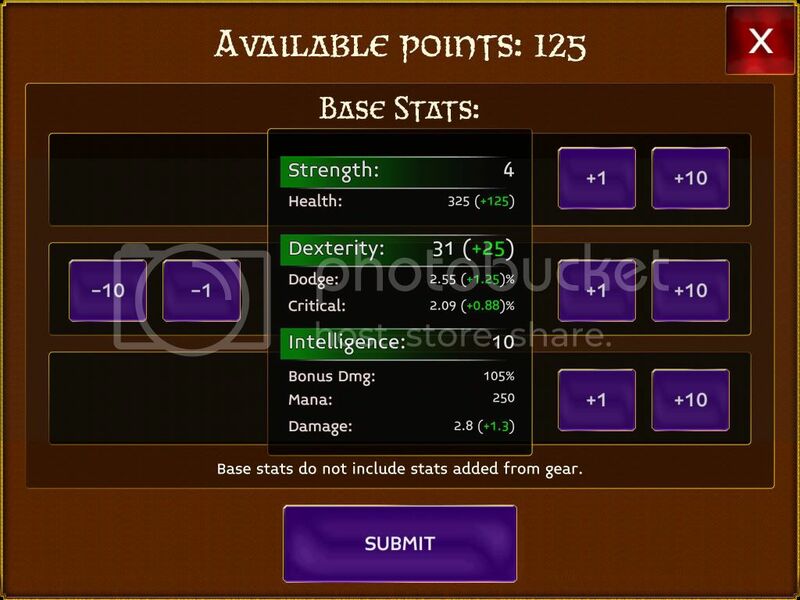 In the screenshot below, you'll see exactly what you gain from adding 5 dex passive (25dex). So basically what is better, 1.8 dmg or 25 health?? I guess that is the decision as the other stats are too small to mean anything. In terms if skill damage, 1.8 dmg would mean around 5 extra skill damage. So for PvP that would mean you would be better off with the health if the battle lasts less than 5 blows, and better with the damage if the battle lasts longer than 5 blows. in PvE obviously the damage would be better most of the time. I think this picture failed to include the bonus damage from INT. At high INT, the bonus damage % will give you more damage per Dex point. The easiest way is to test with the Oracle Gun of Fatality (+ 8 Dex) and Oracle Gun of Force (+ 8 Str). My mage is still at lvl 26 with about 270 bonus damage % from INT, with the Orcale Gun of Fatality (+8 Dex), I get extra +1.1 dmg comapred to the Oracle Gun of Force (+8 Str). So with +25 Dex, you might get around +3.3 dmg (~3x). With higher bonus damage % from higher level INT, I think you may get even more. Anyway, personally, I would add full passive Dex and damage instead of STR because STR is only 125 HP more than 5/5 Dex and this will become less important at higher levels. isnt the % only adds 1point? cos crit also is % and when you do 5/5crit it adds +5 crit on your stats so its not +5%. i am asking the value of +% on stats. then doesnt that 5/5dmg only adds +5 on stats instead of +5%? Last edited by Cero; 04-23-2013 at 03:29 AM. That's a fair point Cero, we are more in the dark for +% damage bonus. Everyone can see that passive crit adds percentage points, if it really added 1%, you would go from 10% crit to 10.1%. That would be pretty useless. With damage % bonuses we see no difference in stats, but I think we can reasonably assume it actually does what it says in the skills screen. That is, it increases your damage value by 1%. So you go from 200 to 202. It's hard to see small differences in damage by just playing, because the actual damage is very variable, so that's why I say assume. One difference between damage and crit, is that crit is a percentage chance stat anyway, and damage isn't. Yes, with damage it is a percentage increase of a fixed number. With crit it is a percentage added to another percentage (not a percentage of a percentage). The decision was between 1.8 dmg or 25 health. However, there is another component here. I have lifegiver as one of my skills. Currently it heals me for around 1200 health (and this number grows as I continue to level up). A 1.8 dmg boost is about a 0.75% boost in damage, so it would result in lifegiver healing me for around 8 more health (and this number will also grow as I level up). So that extra health from lifegiver can be added into the equation. Isnt 25 str going to net 250 health? bro 25dex gives 25hp NOT 25str. Does passive damage show up on the avatar stat page? Someone told me it does but I always heard that it doesn't. And I don't want to respec to find out if it does or doesn't. Does anyone know for sure? It doesn't show up on the avatar page. not really true, 25 dex give 75hp, i sure it, each 1 dex or 1 int gives 3hp, and 1 str gives 10hp. try use granite, granite will add 75hp, and malison add 320hp.